It’s my bestie, chuddy buddy, darlings birthday and she wanted a chocolate cake. 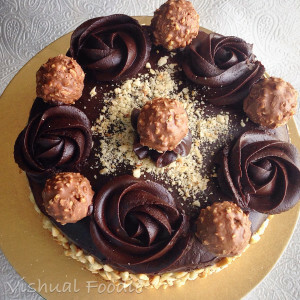 I was sure i didn’t want a simple chocolate cake so decided to make a Ferrero Rocher cake using my foodie bestie Nidhis recipe. (www.soulandspicebox.com). 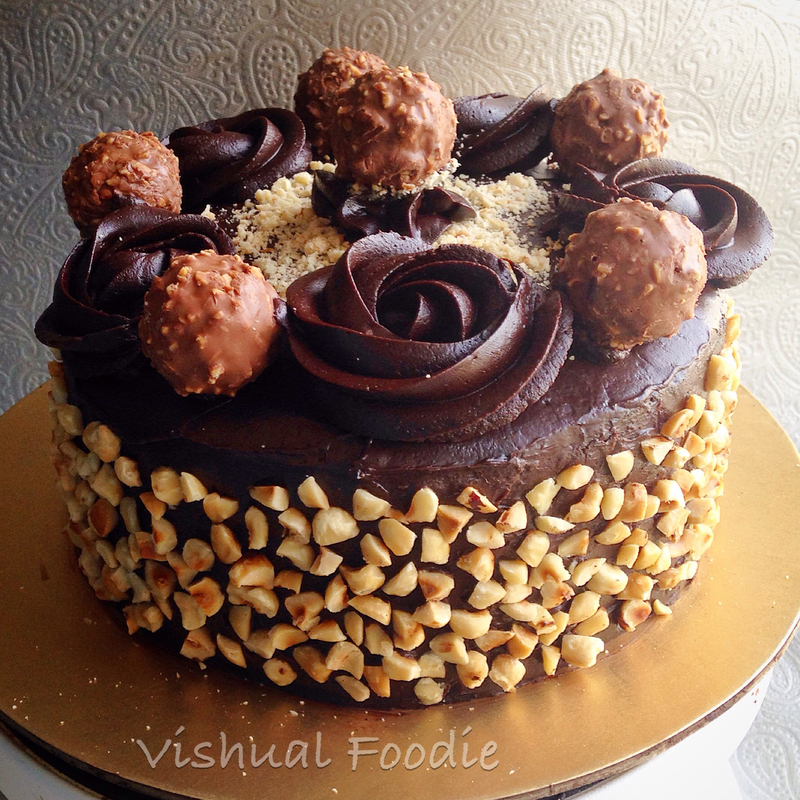 A hazelnut filled chocolate sponge with a ganache loaded with Nutella and multiple Ferrero Rocher to decorate the cake. Who couldn’t fall head over heels in love. Grease and dust a 7 inch baking tin and pre heat the oven to 180 C.
Sieve the all purpose flour, cocoa powder, baking powder and set them aside. In a bowl, add the butter and sugar and whip them till they are well combined. Add the eggs 2 at a time and whip the batter well. Add the vanilla essence and whip it once more. Slowly add the dry ingredients and keep whipping. Add the thick curd, chopped hazelnuts and mix it well. Pour the batter in the pan and tap it to remove air bubbles. Bake the cake at 180 C for 30 minutes or till a toothpick comes out clean. Make the sugar syrup by combining ingredients listed under sugar syrup and use a silicon brush to dizzle it over both the cakes. To make the nutella dark chocolate ganache, chop the dark chocolate into small pieces. Heat the cream till it comes to a bubble and pour it over the chocolate. Add the nutella and let it rest for 5 minutes. Use a hand whisk to mix it ganache well. Make sure there are no lumps. Refrigerate the ganache for 15 minutes before use. To assemble the cake, pour 2-3 tbsp of ganache over once piece of cake. Place the other cake on top and press it well. Use a spoon and offset spatula to spread the ganache evenly on the top and sides of the cake. PS – If the ganache gets too sticky – Boil 2 cups of water in a pan. After every few strokes with the offset spatula, dip the spatula in the hot water and wipe it clean. Smoothen the ganache with the hot spatula to get a perfect finish. Press 1/2 cup of chopped hazelnuts on the sides of the cake. Use the left over ganache, hazelnuts and Ferrero Rochers to decorate the cake. Refrigerate the cake for 2 hours before serving.